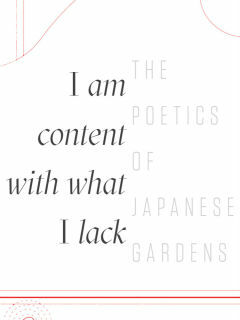 The Japan America Society of Houston will present I am Content with What I Lack - The Poetics of Japanese Gardens, its inaugural art exhibition featuring the works of three Japanese artists and a Japanese landscape architect, all from Houston: Keiji Asakura, Terry Hagiwara, Mari Omori and Masaru Takiguchi. I am Content with What I Lack - The Poetics of Japanese Gardens is inspired by the phrase “ware tada taru (wo) shiru (I am content with what I lack)” inscribed on a stone water basin (tsukubai) in the gardens of UNESCO World Cultural Heritage Site Ryoan-ji Temple in Kyoto. The evocative expression reinforces Zen Buddhist philosophy regarding humility and emptiness, and encapsulates the primary role of the Japanese garden: to provide a place of solitude and transcendence from the mundane world. Curated by Christine Starkman, Museum of Fine Arts, Houston Asian Art Curator, Gallery F at 4411 Montrose will be transformed into a space of contemplation and meditation through the creation of an idealized landscape incorporating garden design, pottery, sculpture, and paper by Japanese artists residing in Houston. Following the opening reception, the exhibit will be on display through September 19.